Ronaldo Wilkins and Bong Kalo will be in action for Vanuatu at the Pacific Mini Games. The Pacific Mini Games will get underway in Vanuatu tomorrow with men’s football leading the way ahead of the official opening ceremony at Korman Stadium on 4 December. Six men’s teams have entered the competition; Fiji, New Caledonia, Solomon Islands, Tonga, Vanuatu and Tuvalu, as well as four women’s teams, Tonga, Fiji, Solomon Islands and Vanuatu, with each hoping to secure gold. In the men’s competition, Match Day 1 on Saturday 2 December will see three matches played at Port Vila Stadium from 9am when Fiji kick-off against Tuvalu. Tonga follow at midday with their encounter against Solomon Islands before the big match at 3pm sees New Caledonia take on the home side Vanuatu. Each of the participating nations have put forward sides of varying ages and experience. New Caledonia have opted to take an U-21 squad, while Solomon Islands, Vanuatu, Tonga and Fiji have brought youth together with experience. Despite assembling a squad at the younger end of the scale, New Caledonia coach Francois Tartas has some talented and experienced players in his midst. Pothin Poma, Henri Boucheron and Marino Akapo have youth international experience, while others will be making their debut as a Cagou. Vanuatu have a side littered with players well used to the pressures of regional football in the likes of Chikau Mansale, Kensi Tangis, Alex Saniel and Jacky Ruben, while Joseph Iaruel, Ronaldo Wilkins, Bong Kalo and Jason Thomas will bring their experience of their successes at the FIFA U-20 World Cup. Etienne Mermer, who led the Vanuatu U-20 side through the OFC qualifiers is in charge of this side and hoping he can once again work his magic. 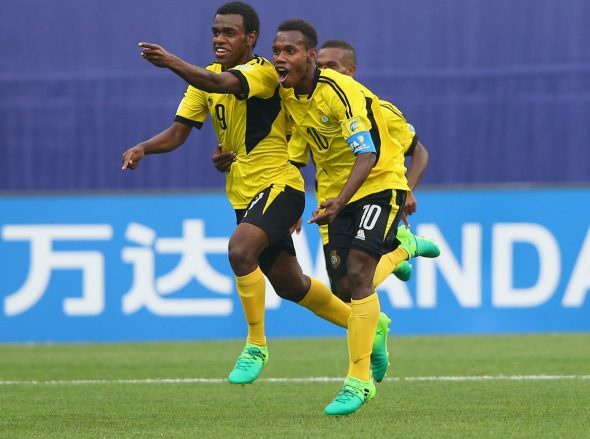 Solomon Islands, fresh off playing the 2018 FIFA World Cup Russia Qualifier – OFC Stage 3 Final against New Zealand, have stuck with a fairly similar squad to that which took on New Zealand. However coach Felipe Vega-Arango Alonso has also added some new names to the list in the form of youth internationals Boni Pride and Adrian Rickson. Junior Albert makes his return to the national team after making just one previous appearance in the first Stage 3 Qualifier match in 2016, while Norman Miniti gets his first call-up. Five members of the Tonga, led by coach Timote Moleni, set themselves apart by the mere fact they were born in before the ’90s, including Tonga veteran Kilifi Uele who has earned himself another call-up to national duty. The remainder of the squad is a young bunch who are starting to make their mark in Tonga and Oceania, in particular Hemaloto Polovili and Soakai Vea who have made both senior appearances and played in the OFC Champions League Qualifier despite being barely in their 20s. Fiji coach Christophe Gamel made clear his disappointment at not having a full roster to pick from for the friendly against Estonia and a similar issue emerged for his Mini Games squad. However the Frenchman has still managed to bring together players who appeared at both the FIFA U-20 World Cup and the Rio 2016 Olympic Games. The final men’s squad is Tuvalu who are being led by Taukiei Itaso as coach. Similar to New Caledonia and Fiji, this is a young side with only three players born outside the ’90s. There has been very little action for senior women’s football teams since the 2015 Pacific Games in Port Moresby, however with several women’s youth tournaments having taken place there are a number of familiar names among the four competing teams. Diane Justus’ Solomon Islands squad ranges from 14-year-old Edith Nari to 32-year-old goalkeeper Betty Sade meaning the team will vary in its technical knowledge and application. Having missed out on participating in the U-16 Women’s Championship due to passport issues, this is an opportunity for the younger squad members to show their talent on the regional stage, while for the veterans of the 2015 Pacific Games campaign this is a chance to improve their performances. Marika Rodu has drawn on the talent identified during the most recent women’s youth tournaments to form the backbone of his Mini Games squad from OFC U-19 Women’s Championship Golden Glove and Golden Ball winners, and cousins, Ateca Tuwai and Luisa Tamanitoakula to their teammates Aliza Hussein and Cema Nassau. Tonga will be led by Christian Koaneti who, like Rodu, has been working with his players through the youth programmes. Dual international Seini Lutu was a stand-out for Tonga at both the U-19 and U-17 Championships this year despite still only being 16 years old. Even further experience comes from Ofaloto La’akulu and Heilala Moala who will run the backline, while Penateti Feke can manage either the midfield or lead from the front. Finally, Vanuatu have been building up to this tournament for some time with the women’s team having spent an extended period in China preparing. Coached by Wu Kangzhen, the most familiar names are those which appeared during the OFC U-20 Women’s Championship in Tonga in 2015. Eva Boe, Monica Melteviel and Louisa Kalpram also have the 2014 edition under their belts.